Many houses in Rose Park are 100 years old. To help you find out the age of your house, use this link to Long Beach City Records. Here are some great homes around Rose Park and Rose Park South. A few years ago I was in the middle of scraping paint off a door. (I had made it through the 1950’s and was heavy into the 40’s) when my next door neighbor came over. 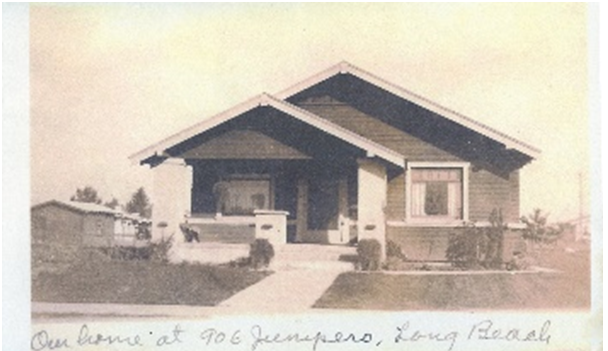 She had received a letter in the mail from Alaska simply addressed “906 Junipero Ave, Long Beach”. Inside was a short letter & a photograph. It was an old photo of her house from 1918. A correspondence began and this is the tale it told: A young mother in Alaska opened her grandmother’s baby book and found the photo inside. She took a chance that the current owner would be interested and mailed the photo. My neighbor was delighted and wanted to know more about her. The young mother complied: Her grandmother was Marie Elizabeth Rollier, born in the house on Junipero on January 1, 1911. The 1910 fire destroyed all Long Beach records so she used to joke that she was the first person born in Long Beach! Marie’s mother was Mary, a Russian immigrant, her father was Antoine a LB postman. I found an article in the LA Herald from 1908 called “Potatoes Grow in Air” about Antoine living at 740 California St growing potatoes on a vine 8” above the ground. Antoine and Mary lived at that address until they took the family to Africa as missionaries. 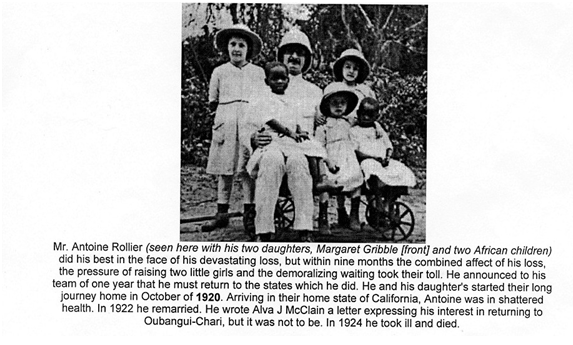 Sadly, Mary died in Africa but Antoine returned to Long Beach and remarried. The letters Mary & Antoine wrote describe their family of themselves and 2 daughters, Marie and Julia. Antoine mentions that the house used to be his mother’s so we wonder if she built it. Mary wrote in one letter: “One month since I came back home from Nebraska oh it so nice to be home again while I was glad to see all my folks I am so happy to be here with my dear husband.” Another letter describes Antoine’s negotiations with the real estate agent, Wm Clague 2231 E 2nd St. Telephone 780J, who is helping him sell the house before they leave for Africa in 1919. Thanks to my neighbor Barbara Fox for sharing so we can all enjoy a little window into the past. For me, I guess I have to continue looking out my kitchen window and wondering about the families that knew my house and why I can’t seem to get my doorbell to work. One October day in 1986, about four months after we moved in , I was planting bulbs in the front yard. Just when I planted the last of the daffodils the requisite eight inches underground, I became conscious of an elderly woman having passed along several times. It occurred that she might be lost, or at the very least, might want to chat. I disengaged from my sound system (Emmylou Harris – “Quarter Moon in Ten Cent Town”), looked regretfully at my dirt stained outfit, and said hello. She asked if she might speak to me for a few minutes, and of course I said I’d be delighted. “I grew up in this house”, she told me. At that, I insisted that she come in, meet my partner, and look around. A few minutes later, I heard her in the kitchen, crying softly. “Mary”, I said, “What is it?” And she told me that she had just heard her mother whisper that everything was going to be alright. And thus began a 20 year plus friendship that flourished until her death a few years back. From Mary, I heard juicy details regarding each of the original tenants in our neighborhood, several of whom still lived in the neighborhood. Stories that I will never repeat, I promised her. Some details I feel good about sharing: Our house was built by her grandfather, Grandpa Kulp, in 1918. It sat atop Signal Hill until the discovery of oil, and was moved to its present location in 1922. Mary was kind enough to provide pictures of the house before, during and after relocation. She took relish in the detail that at only one intersection, Cherry Avenue and PCH, were there any wires to be moved. Mary was someone with whom no topic was taboo. She had an open mind, an inquisitive spirit, and boundless love. Fred and I picked her up from her home in Palos Verdes, and had her as our dinner guest on many occasions. Politics, religion – we covered them all. She spent her last Christmas with us, and I can easily recall the picture of Mary in the easy chair before the tree, favorite kitty on her lap, and our enormous Golden Retriever at her feet. We consulted Mary when repainting the house. At her memorial service, one her friends described her as a “lifelong Republican” who had lately begun sprouting some scandalously liberal opinions. I strongly suspect that some of her late in life conversion was the result of those dining room table conversations! Fred and I were the youngsters when we moved into this house, but have both developed the ability to predict weather by our aching joints of late. Our commemorative brick in Rose Park reads “Dennis Herbert and Fred McEntire, In Mary Lowe’s House”. 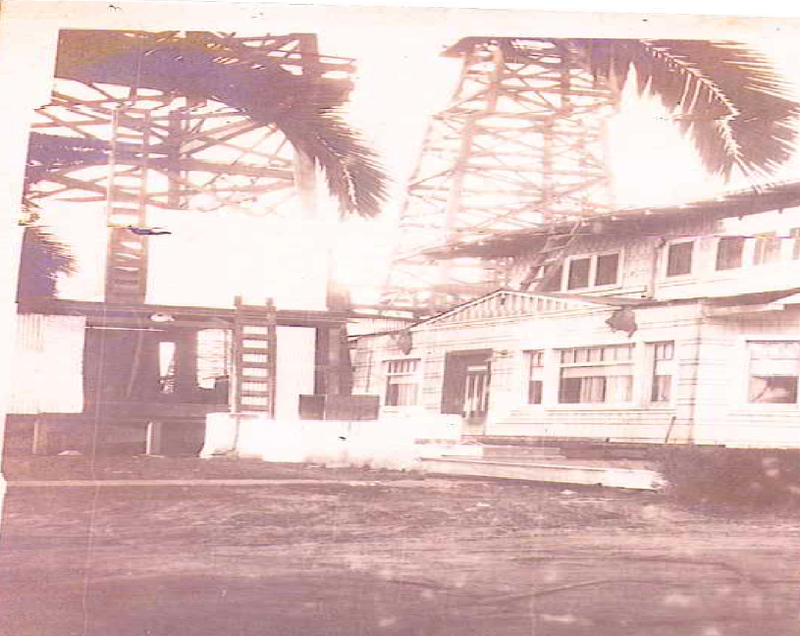 Photo Captions: One of the pictures(with the oil well) is moving day…front porch removed. The other was how it looked atop Signal Hill.